Too long I had no desire to visit Morocco. I thought it egzoitčnom country, but when I finally got there, I realized that was not what I had imagined. Not exotic, different from anything that I thought was magical. We arrange visas and go in a seven-day expedition called Morocco. We’re flying business class to Casablanca and we are on the plane without Ihram. All the other passengers were dressed in the traditional long white robes returning from a pilgrimage to Mecca, in Saudi Arabia. 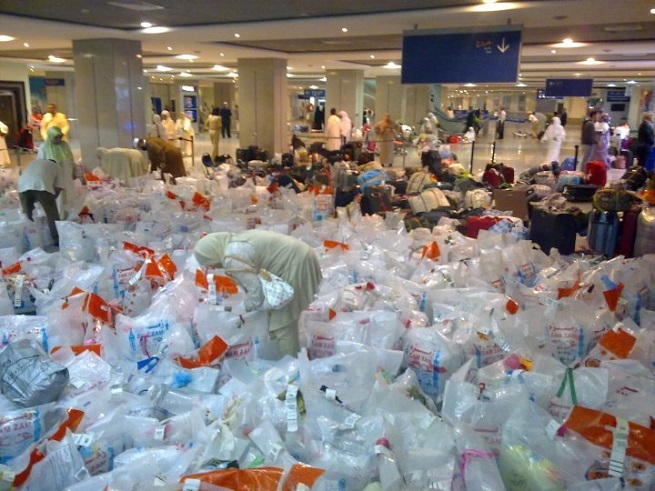 At the airport waiting for us a huge amount of water canisters that special permits transfers from Mecca. Holy water. Gallons and gallons of water coming, and our luggage is not in sight. We were delayed a couple of hours at the airport, looking at the tape for luggage, but our suitcases anywhere. We stay for some time at the airport, “Mohammed V”. Hope dies last. Fill in the lost luggage and go to the hotel. Food and beer all lenses, so it was this time. By the late hours of today’s retelling adventures tired and go to sleep. Dawned cloudless morning. Although we have already agreed upon a plan for the first day we go to the airport to see if we have better luck today. I told you I was scantily dressed hit the road. It was the same the next two days, and we have not returned bags. Buy a scarf to cover as much as possible, but it seems to me even more eye-catching passers-by on the street. We’re laughing and kidding on this topic and if we is not exactly all the same. The lesson for the next time I learned the hard way, but do not expected of me to be like a normal person. 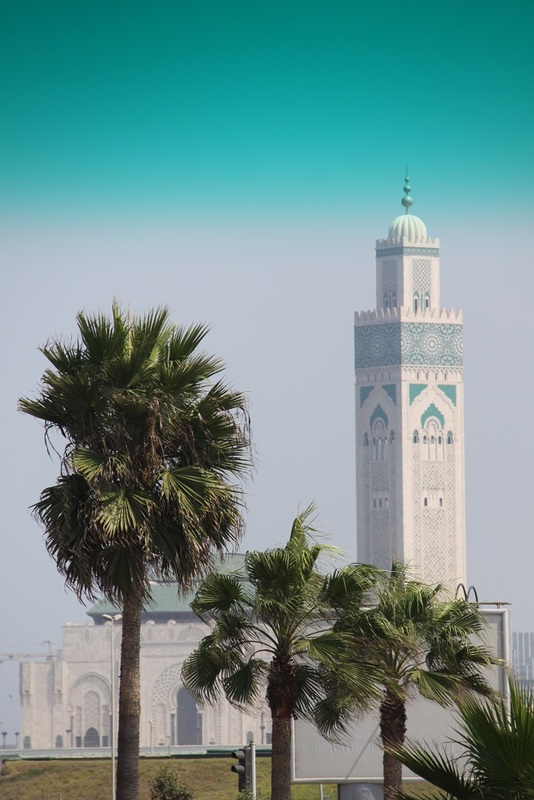 Casablanca is Morocco’s largest city, industrial and economic center of the country. The city center is dominated by French architecture. Compound European and African sensibility is evident at every turn. We walked around the city … there is a big misery in the streets, and then you find yourself in a part of town near the ocean where everything sparkles and shines and where the vast grandeur. It was not planned to swim in the ocean, but while we’re here, only feet to get wet . The five of us jump into the water and disbelief on the other enjoy the warm ocean. Wet the bus and after a short drive we are in front of the fabulous buildings that are breathtaking and on which I will remember for Casablanca. Hassan II Mosque, minaret with a height of 210 meters, the second largest mosque in the world. At any time, it is possible to visit her even 250,000 people. Located on the peninsula and improvised on three sides appears to float above the ground while the lapping waves. Local guide who delighted that we are from Serbia and who admires Titu we conducted in the mosque. Although I thought, looking at the plateau and the mosque from the outside, I’m thrilled, breath stopped you even more when you look at and walk around inside the mosque. Imperial cities of Marrakech, Fes, Meknes and Rabat, the capital, are the greatest treasure of this country that even today in its walls kept secrets of ancient kingdoms. They represent the most valuable wealth of Morocco. Their Medina centuries nothing had changed. They are under the protection of UNESCO. Within them, in a maze of narrow souks, life of small craftsmen and traders takes place in a completely different course of time, and only a few steps far from there are magnificent boulevards and buildings of modern architecture. 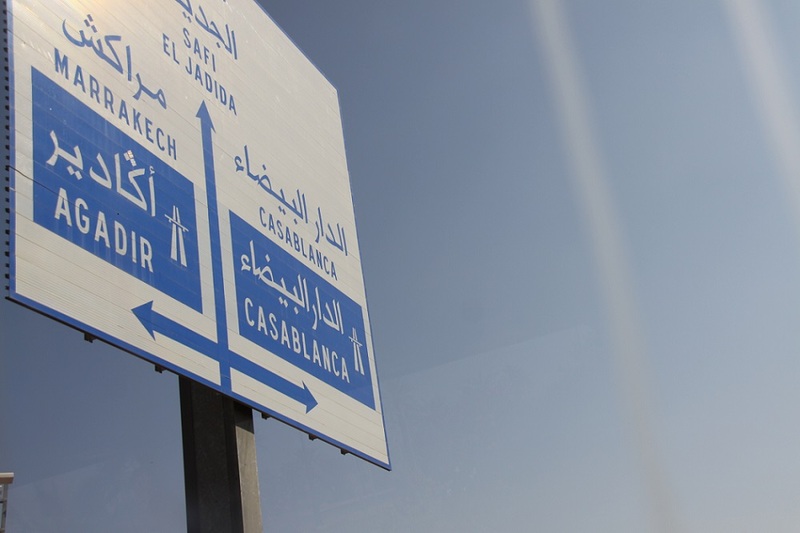 From Casablanca move to Rabat, the capital town. We walked around the old city, the medina. 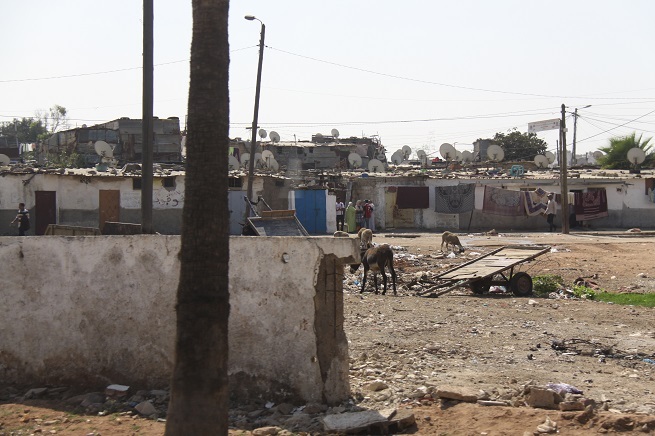 Rabat is also known as the white city. Magnificently beautiful and proud, Rabat their goods displayed behind those walls. We went up to the tower of Hassan. These are actually the remains of the unfinished minaret mosque whose construction started before the XII century. He never completed, a further earthquake had destroyed in 1755. He stayed only a part of minarets, which reaches up to 44 meters in height. The mosque is supposed to be, after Samarra in Iraq, the largest place of worship in the Arab world. In Medina, the most interesting oriental bazaar, suk. Most are represented clothing, but there is everything else, food, spices, furniture, souvenirs, gold and silver jewelry, leather goods, cafes … In most cases, you should to negotiate, but there is no “drawing the sleeve” and assertiveness. Most unexpected guests and customers the local population. Most of the women with scarves to cover their hair, only very, very rarely some persons covered mask. Tourists are really in the minority. I have a feeling that we are drowned in the crowd that nobody notices foreigners, that they not given an attack, special attention, visible only because we laugh that loud. We enjoy all the senses. After walking suk we embarked for a walk to the city. Some neighborhoods look like the European. New skyscrapers outside are like most European residential buildings and wide boulevards. 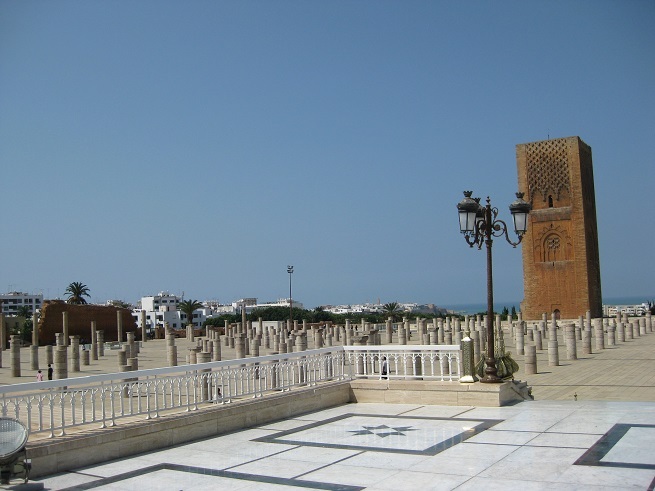 However, the mausoleum of Mohammed V, father of Moroccan independence, which was built by his son, King Hassan II gave a striking image that we carry Rabat. We spent a lot of time recording and commenting on the beauty of the interior: the ceiling made of cedar wood and marble floors. No less impressive is the approach the mausoleum, a plateau with dozens of columns, a fountain and two horsemen at the entrance. Lunch in a traditional restaurant, a lot of salads, chicken, fish and fruit. It’s delicious and I love that when I find myself in a foreign country, benches only their food. According to the principle – live like a local. However, using a mix of spices that is beautiful when you try it in the first or second meal, but after the third meal all you seem to taste the same. We eat, but all the food on the plate, smells the same and has the same taste. 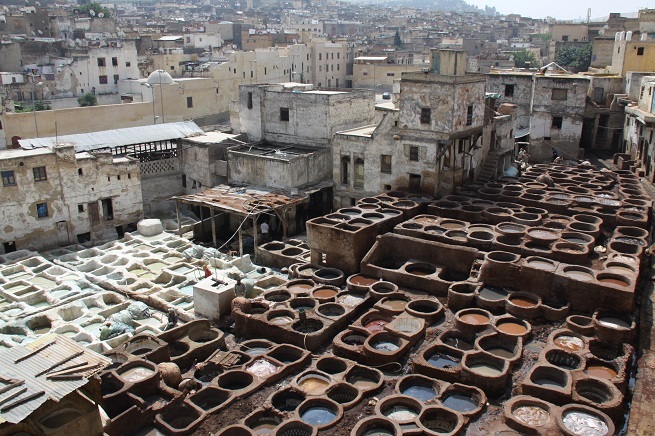 Fez, the blue city. It is divided into three parts. 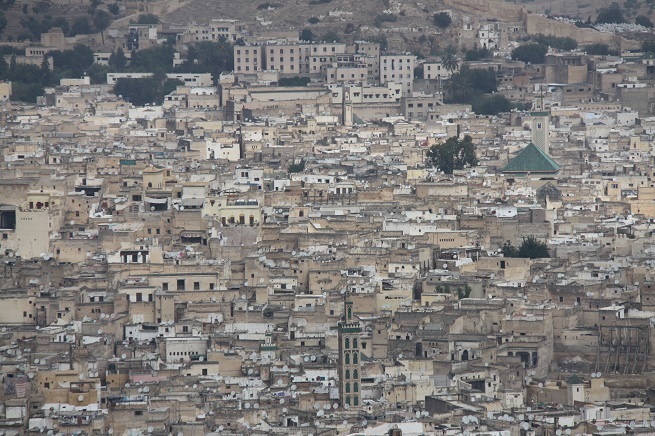 The old part of the city – Fez el Bali, the new The festival Fez-Jdid, the newest part of Fez- Ville Nouvelle. We went first to a plateau above the city to look at the height of the city, to try to understand what is expected of us. However, when you enter the city, you enter into a time machine and from one city you moved into the distant past breathtaking and you can not believe my own eyes. The old part is completely preserved medieval town, in fact, considered the best preserved historic city in the entire Arab and Muslim world. Medina will fascinate you architecture. Here will have no problem wandering the labyrinth of streets (and there are about 9,000) to meet lifestyle, arts and culture that successfully resists modernization. Everything I have here. Potters and ceramists are real magicians. Art crafts will give you an insight into the skills of various guilds. Walking through the narrow streets, we lost track of time. Whichever way you go you will find something that you’ve never seen or experienced. Tannery in the city center is on me left the biggest impression. Pools for tanning and skin coloring a variety of natural colors. We listened to the story of the friendly hosts who explained how and in what way the skin preparation, color, dried and then processed. What is a must when you come here it is -take mint plant that you kind hosts offer because the smell that spreads here is not pleasant. Biting your nose and pulls you under my skin. After all, we flew to the store purchasing leather items that are made here. We also visited a textile shop, clothing and fashion show rules Moroccan costumes from beautiful materials in a variety of colors, and then watched as the hand-made carpets and learned to distinguish from Arab Berber. 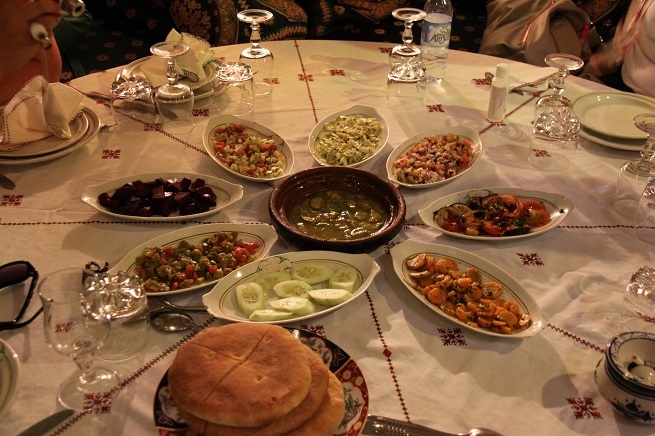 Food in a typical Moroccan restaurant, salads and vegetable dishes as well as appetizers, olives, Tajin or couscous, a typical Berber dishes, followed by fruits and fresh mint tea. When we left the restaurant the town was empty, all the shops are closed. It’s time for a break. The road leads us through the Atlas mountain range. The highest point is at 4,167 meters and separates the Mediterranean from the Sahara Desert. 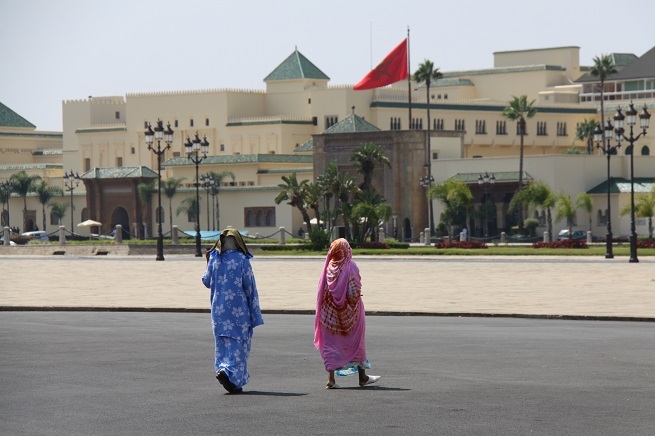 Local people are Berbers. 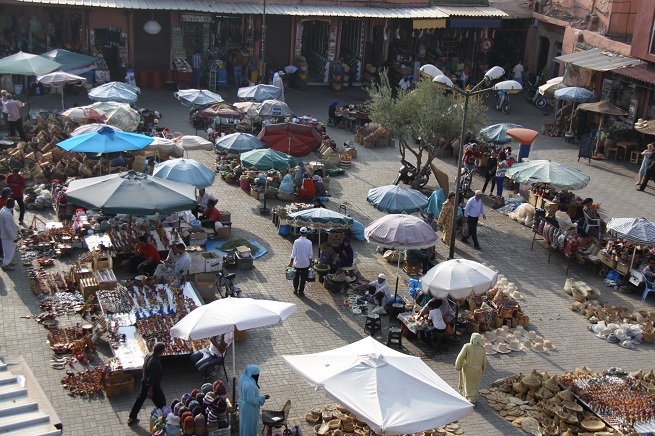 At the foot of the Atlas Mountains is located in Marrakech, the red city. 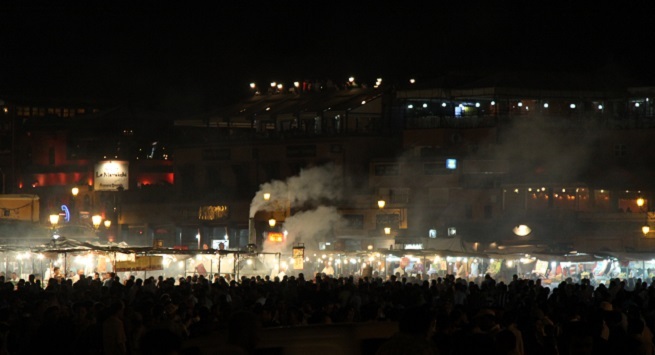 Marrakech is more than a city, we found it when we came in the evening to the symbols of the city, El Fna Square, Gemma. A market hundreds of makeshift deli, Tea Room, snake handlers, musicians. As long as you look you can achieve something interesting to see on the market. Government chaos everywhere, a lot of people and the atmosphere is amazing. In the morning we are on this same square fled the market with various goods on the stalls. 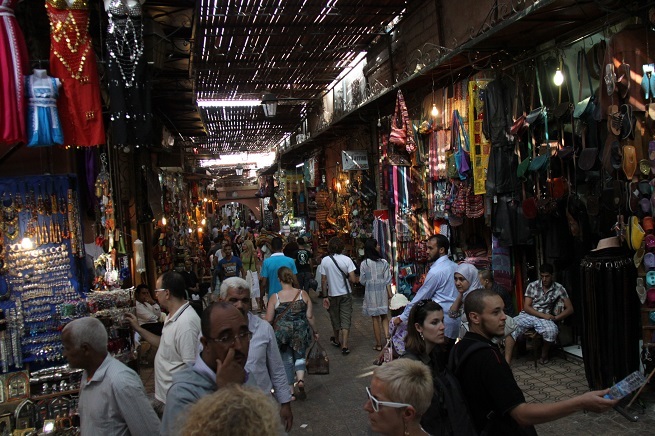 Marrakech is unlike the other cities we visited with tourists from all over the world. We wander the streets, visit the botanical garden, pavilions, gardens, come to the mosque. We are not allowed to enter, but we looked. Marrakech is a city full of life. From it you can take the most colorful souvenirs. Ash Yves Saint Laurent is littered with the city, it was his last wish. The new part of the city of Marrakech’s make-up, reminiscent of European cities. Walking through it we saw a McDonalds. Earlier I myself scolded and reproved people in other countries are consuming this type of food, but we were hungry. Already this week we eat similar food and our eyes widened when we saw the food that we know well. Flavors of most products that we bought were not the same that we used to, but it does not matter, hunger won. We ate that much food … for not believing. After we enjoyed the pool in the sun and summarized impressions. Morocco will serve you and show you a different way of life. Will you like that style? It all depends on you. Mountains, deserts, oceans, cities, people, sounds, smells and colors will remain forever etched and bonded with and in us, as well as a friendship, a friendship for life. Thanks Morocco.